The point of playing a game is to win. Any gamer who takes their game play seriously looks for every advantage to dominate. If you really want to go for the win, your home network shouldn’t be the bottleneck that prevents you from achieving. Your network should provide you with the ability to play at your best, so you can focus on the opponent, not the technical limitations of your network. Do you have too many devices on your network competing for bandwidth? 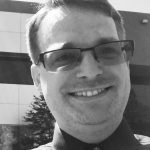 Do you need a way to improve responsiveness and throttle and share bandwidth with QoS? If so, you’ll need a powerful hard-wired fine-tuned local network that will perform at its fullest potential to unleash your gaming potential with faster speeds, higher performance, and more control of your game. Despite the most recent advancements in WiFi technology, most gamers choose to hard-wire their PC or Console to the router. Hard-wiring your network is the only way to ensure that the network is not to blame if you crash and burn. With a hardwired connection, you can be assured that you are getting the absolute fastest speeds and the lowest latency with no lag from your internet connections. But that’s not all – you’ll want to get some super-fast lanes on that switch! Most common broadband internet connections are approximately 25 Mbps – 100 Mbps, though some ISPs are starting to offer more than 1G internet speeds, in the US. Even at full tilt, most broadband connections only use about 2.5 – 10% the speed of common 1G LAN ports. Regardless of this fact, nearly all common internal LAN ports are gigabit and growing – more and more devices like motherboards and gaming laptops (NICs) are 10Gig/Multi-Gig. That means you can control the speeds between your devices inside your house regardless of the internet speeds you’re getting. However, the story changes as soon as multiple devices on the same network start communicating with each other. With the number of hard-wired, LAN connected devices, from internet connected TV’s, PC’s, game consoles, and more, it’s very easy to run out of LAN ports on even the most generous routers. 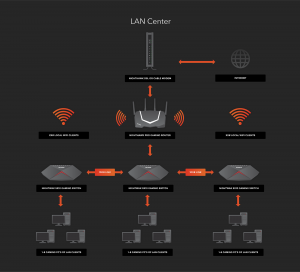 If multiple devices are split between multiple LAN switches (for instance, your game room can connect via 1 Ethernet Cable to a switch in your home office), a significant amount of traffic will travel over the ports that are connecting two LAN switches together. A single 1G port can get overwhelmed. To maximize the traffic that can travel between two switches, you want more capacity on that link. Our 10G/Multi-Gigabit ports are like a super capacity freeway that connects two cities. This back-end 10G connection is the high-speed backbone of your network. Increase speeds and expand the bandwidth of your network with auto-adapt ports with 100M, 1G, 2.5G, 5G or 10G connectivity. 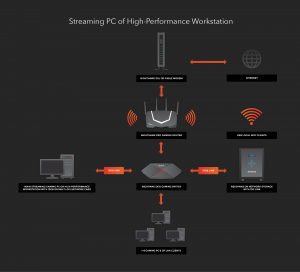 SX10 Nighthawk Pro Gaming Switch – Fastest LAN ports, gaming interface and killer looks. The Nighthawk SX10 Pro Gaming Switch has 8x 1G ports, and 2x 10G/Multi-Gig ports. The SX10 is the first gaming focused switch with 10G/Multi-Gig capabilities, able to deliver 10x the speed of common gigabit Ethernet switches. With the 10G ports, the SX10 can transfer over 1 gigabyte of data in less than one second over standard copper Cat5e – Cat7 Ethernet cabling. Of course, we didn’t just stop at making the SX10 Nighthawk Pro Gaming switch the fastest switch available, we also tricked it out with an amazing gamer-focused dashboard, QoS (Quality of Service) capabilities, independently controllable LEDs, and killer-looks. All configurable from one screen. Gaming dashboard: for the control you need of your network, with a few clicks you’re able to prioritize port bandwidth to your console or other gaming devices, and get real-time insight on performance. Customizable RGB LEDs: Personalize each light, including the power-V on the front to fit your gaming vibe. Killer looks & quality: premium metal casing for durability and sleek design. If you want excellent switch performance, but are not quite ready to make the quantum leap to 10G networking, consider the Nighthawk S8000 switch. With the same killer look and feel of the SX10. The S8000’s network prioritization engine enables lag-free gaming, making you a force to be reckoned with. An additional use for the SX10 Nighthawk Pro Gaming Switch is to provide a high-speed LAN link to a local Network Attached Storage device (NAS), for example, a NETGEAR ReadyNAS RN526. The RN526 has a 10Gbs port on it. If your computer is equipped with a Multi-Gig or 10G network card, it will be able to connect to your ReadyNAS 10x faster. Most NAS servers are able to easily max out a 1G connection even if relatively slow drives are installed. If SSD’s or hybrid drives, the situation becomes even more dire for a 1G link. The ultimate gaming experience just got better. Stay tuned for more info and discussion of the Nighthawk Pro Gaming SX10 and Nighthawk S8000 Switch and visit the Nighthawk Pro Gaming Switches forum. Not only are the Nighthawk Gaming Switches powerful enough for a device filled home, you can also use them in larger gaming centers. Click on the images above to see our examples.